"I would rather have Toby's help than that of the whole detective force of London." Sadly, I couldn't find any pictures of my Toby. Truth be told, he wasn't quite as good as the original version. Would I call myself a Holmes purist? Yes and no. I have personally always enjoyed works loyal to the original Conan Doyle, like the Brett series, but I’ve also enjoyed works that have tweaked the character a little bit. I enjoy the WW2 era Basil Rathbone films where the Great Detective matched wits with Nazi agents. Billy Wilder’s unorthodox The Private Life of Sherlock Holmes is an extremely underrated film (and boasts one of my favorite films scores, composed by the great Miklos Rosza). Michael Chabon’s, Nicholas Meyer’s, and Laurie King’s literary pastiches are all fairly worthwhile. In some respects, and it may be the postmodernist in me, I actually appreciate and applaud it when intriguing and compelling variations are made on a timeless character. 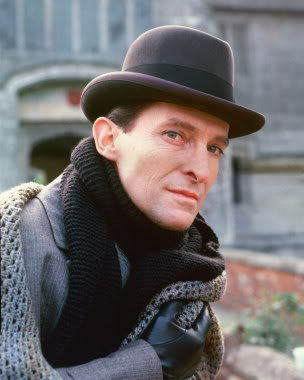 Jeremy Brett's interpretation of Holmes for the 1980s/90s Granada Television series is the undeniable best. To make a comparison to another of my favorites, while I love Richard Donner’s Superman (1978), it is by today’s standards underdeveloped and simplistic,and I didn’t want to see it revisited nearly verbatim in 2006’s Superman Returns. I wanted to see a more advanced character, far removed from the cliches and the commonplace elements of the earlier version. I tend to think in Holmes, I would like to see the same thing; he has become such a part of pop culture iconography and has so informed the tenets of mystery literature that his character often runs the risk of becoming commonplace in his own right. However, did I really want to see Sherlock Holmes re-imagined as an action hero? I was fairly sure I didn’t, but as I watched the movie, I discovered something surprising: I was actually enjoying myself, and had little reservation in doing so. 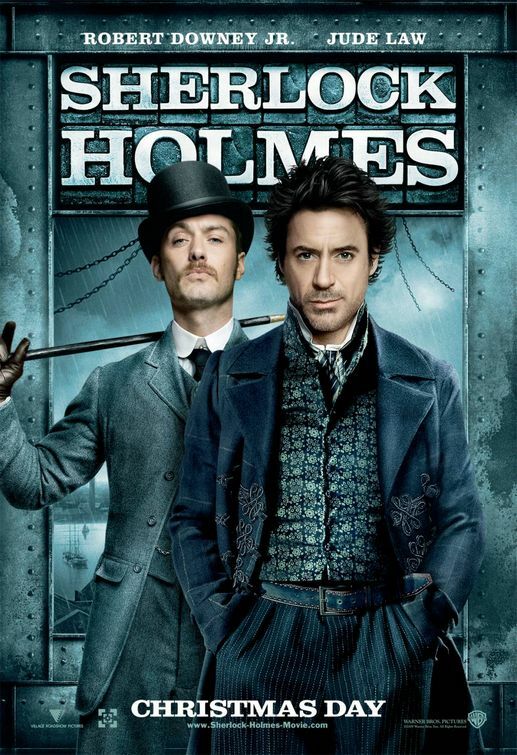 Robert Downey Jr., as one would expect, was terrific as Holmes (even though a little on the short side), and Jude Law was a very good Watson, one thankfully more in keeping with Conan Doyle’s original everyman character than the comic relief of other versions. More than that, however, it reminded me of why I liked Sherlock Holmes in the first place, and what he really is when it comes right down to it. While many like to imagine that Holmes stories represent a high form of literature that accurately represents the cunning, peerless intellectual standards of its main character, at the end of the day, Sherlock Holmes stories weres supposed to be fun. It’s mass culture for intellectuals, by today’s standards, but mass culture nonetheless. And for all of Conan Doyle’s erudite prose and dialogue, and ingenious dramatized deductions and analyses, Holmes and Watson literally chased down the villains and slugged it out with the bad guys on more than a few occassions. Heck, what is “The Final Problem” (the first of the stories my father ever read me) if not a build to one final knock down, drag out battle between Holmes and his nemesis Professor Moriarty on the precipice above Reichenbach Falls? As for the movie itself, besides being extremely entertaining, the film could be reasonably clever when it needed to be. Downey and Law have the chemistry together to carry the movie when they need to, and the timeless charm of the characters and their relationship shines through. But it certainly isn’t without its flaws. Some of the fight scenes were a little silly. The dependably malevolent Mark Strong wasn’t given a particularly engaging villain to work with, and the mystery itself never really clicks on the level that a great Holmes mystery does (you always know whodunit, and the revelation of how and what are somewhat intriguing but ultimately not surprising.) And while I understand that it’s popular wisdom that the late Victorian era was hopelessly repressed (despite the rampant prostitution), I certainly fail to see why everything had to look so gray. The movie’s in color, after all. 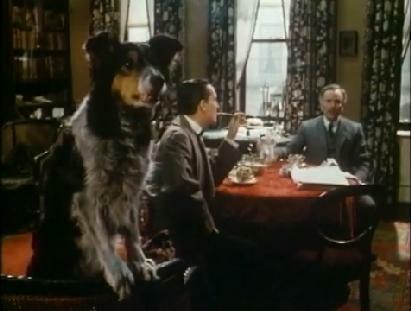 In the end, though, Ritchie’s Holmes was a movie worth seeing, even for an ardent Holmes fan, who may be free of the fears of having seen it receive the Van Helsing treatment. But it may even be a better film for someone who isn’t an ardent Holmes purist, because if this movie reminded me of anything, it reminded me of the two reasons my Dad read me “The Final Problem” in the first place back in 1986: Young Sherlock Holmes (1985) and The Great Mouse Detective (1986). 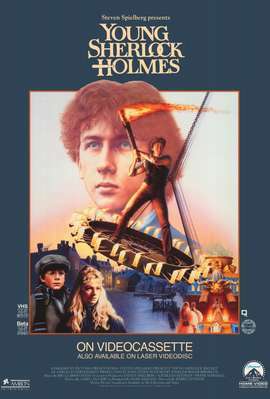 "Young Sherlock Holmes" - known derisively as "Sherlock Holmes and the Temple of Doom." For those of you not familiar with either of these pieces of Holmesian Cinema: Young Sherlock Holmes was an attempt to tell Holmes and Watson’s early days a la Indiana Jones with a heavy dose of early Pixar FX. Though I found it endlessly rewatchable as an eight-year old, by today’s standards, it does NOT age well. The Great Mouse Detective, meanwhile, was a Walt Disney animated movie based loosely on E.B. White’s Basil of Baker Street, Sherlock’s rodent counterpart, and it’s decent fun, if a bit childish. 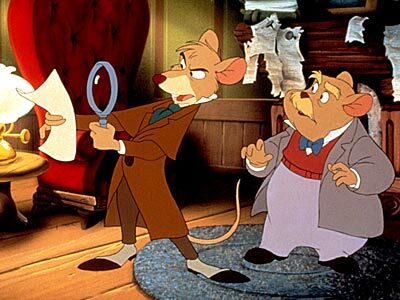 The Great Basil of Baker Street and his trusted companion, Dr. Dawson from "The Great Mouse Detective.". Any similarities to other fictional characters, of course, are completely coincidental. Neither of these works became synonymous with the Holmes I’ve enjoyed and remembered, and both were hardly faithful to their source, but they were my starting point, for better or worse. It is with this attitude that I choose to view this new, atypical Sherlock Holmes. Is it the Holmes I idealize? No, not at all. Is it a Holmes that can be enjoyed? Yes, absolutely. And for that, it should be appreciated, because if it helps more people discover the character as I did, as a source of fun and enjoyment, then despite all its deviations from the original material, it’s ultimately done its timeless character a great service. Posted on December 8, 2011, in The Antiscribe Appraisals (Reviews). Bookmark the permalink. Leave a comment.